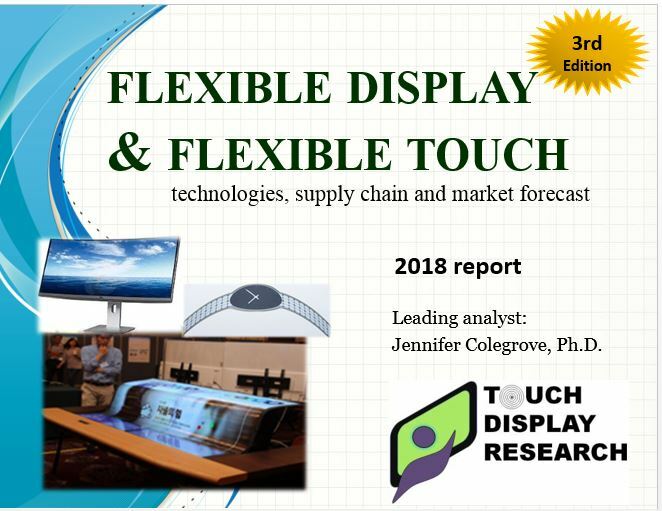 Flexible Display & Flexible Touch 2018 Report - Touch Display Research, Inc.
Santa Clara, California, November 27, 2018—In the recently published “Flexible Display & Flexible Touch Technologies, Supply Chain and Market Forecast 2018 Report (3rd Edition),” Touch Display Research analyzed over 10 flexible display technologies in 13 application markets, with detail of substrate material type and form factor. This report profiles over 270 companies working on flexible display and flexible touch screens. “Three years ago in the Flexible Display 2015 Report, Touch Display Research forecasted flexible display industry will take off in 2015 to 2018. That forecast became reality. We are witnessing flexible OLED display, flexible e-paper display, flexible LCD and other flexible technologies having a big leap right now,” said Dr. Jennifer Colegrove, author of the report, principal analyst of Touch Display Research Inc.
Touch Display Research experts have been writing display industry analysis reports for over ten years. You can access this expertise by purchasing and receiving the report today. The “Flexible Display &Flexible Touch Technologies and Market Forecast 2018 Report” 3rd Edition is available immediately. Report sample, table of contents are available upon request.